Anisodes subrosea Warren sensu, Holloway, 1976: 63. 13-15mm. This species is a more uniform brick red than the previous two, resembling C. subrosea Warren (New Guinea, Seram) and C. acritophyrta West comb. n. (Luzon). The fasciation is faint, with small black flecks on the postmedials and a small pale-centred, dark discal mark on the hindwing. The genitalia indicate a relationship to subrosea, as both species have a rather tonguelike, rugose structure at the apex of the juxta, and lack projections from the apex of the valve costa, but the aedeagus is more as in dimerites, with basal and distal sets of spines in the vesica, rather than a very long row of spines as in subrosea. The bursa in the female is much more heavily scobinate than in dimerites, waisted rather than centrally expanded. 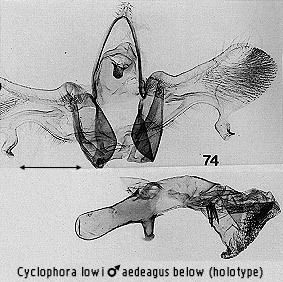 Holotype . SARAWAK: Gunung Mulu Nat. Park, R.G.S. Exped. 1977-8 (J.D. Holloway et al.) Site 2, January, Camp 4, Mulu, 1790m. 452463, [upper montane forest], BM geometrid slide 18137. Paratypes: l as holotype; 2 (slides 8976, 8980) SABAH: Mt Kinabalu, Power Station, 1930m, vii-ix.1965. Cambridge Expedition to Mt Kinabalu 1965 (H.J. Banks, H.S. Barlow & J.D. Holloway); 1 SABAH as above but Park H.Q., 1620m; 1 SABAH as above but Kiau Gap, 1760m, slide 8975; 2 SABAH as above but Kamborangah 2110m, slide 8968; 1 SABAH as above but Radio Sabah, 2600m, slide 8979; 5 Mt. Kinabalu, Lumu Lumu, (2, 5500ft), Marei Parei (5000ft) and Kamborangah (7000ft), 1929 (H.M. Pendlebury). Habitat preference. This is another species of upper montane forest, being most common on G. Kinabalu at 1930m, but ranging from 1620m to 2600m.